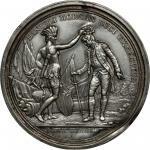 1690 Quebec Liberated Medal. 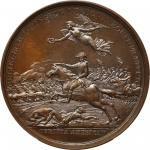 Paris Mint Restrike. 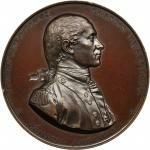 Bronzed Copper. Betts-69. 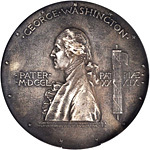 MS-64 BN (PCGS). 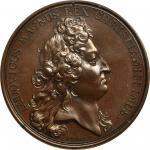 1747 Lord Anson Medal. Silver. 43.3 mm. 33.4 grams. Betts-382, Eimer- 616. Extremely Fine. 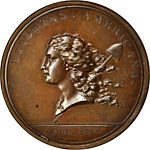 1781 (1782) Libertas Americana Medal. Copper. 47.8 mm. By Augustin Dupre. Betts-615. AU-58 (PCGS). 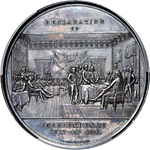 1976 Libertas Americana Medal. 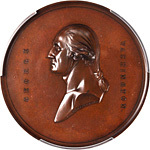 Modern Paris Mint Dies. Silver. 78 mm. #0321. MS-64 (NGC). Undated (ca. 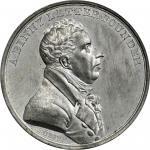 1816) Archibald Binny Medal. Joined White Metal Splashers. By Moritz Furst. Neuzil-51. 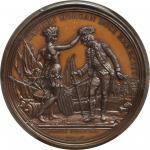 1781 Daniel Morgan at Cowpens Obverse and Reverse Splashers. Uniface. 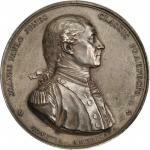 White Metal Backed With Paper.